The recent cold snap let me collect some interesting new data. Previously I had reported on temperatures in the building with the solar heat on and off, but that didn’t tell how much energy was being captured by the collector. At the end of that post I speculated on a way to approximate measuring the energy. The ratio lets me predict, knowing the HDDs, how much energy the building would use. It Worked! The Solar heater came on for 4-5 hours. While I never saw the temperature inside rise above the 55F thermostat setting, I used 6 KWH fewer than the HDD on Wednesday would predict. 6 KWH is 22% savings – about 1/4 of the energy, which roughly agrees with the collector operating for 1/4 of the day. The building has no thermal storage, its like a greenhouse that warms up in the sun and cools again when the sun sets. The water heater portion of the system is the way I will store energy. I hope to do a final system leak test on that system this Saturday. I have been making (slow) steady progress on the “Cookhouse” project. The utilities got installed over the summer by some great contractors: Nolan Heating, Jeff’s Electric, Don’s Plumbing, Jamin at Energylock for the spray foam insulation and Tom at Avista for the new transformer. 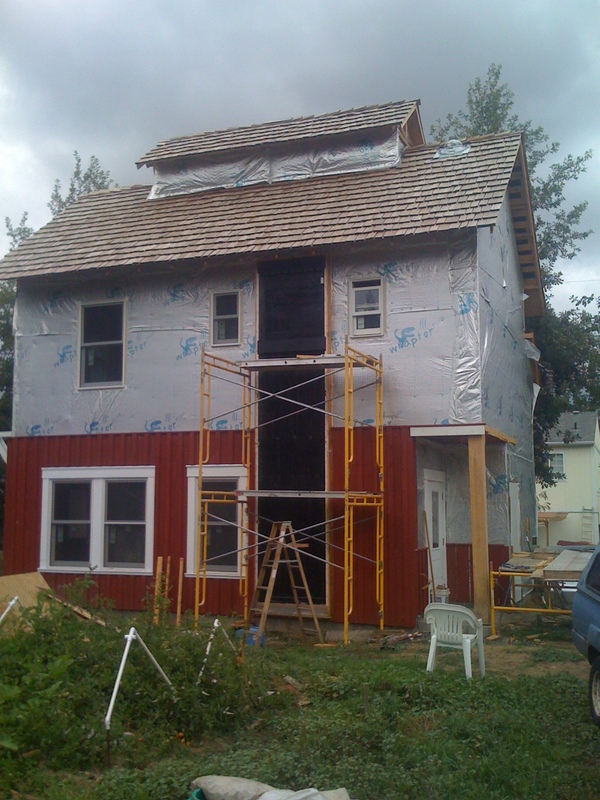 I spent Sept-Nov working outside on the siding which caused me to need to get the solar air and water heaters finished up enough to put the glazing on. I built two things into one collector. The lower 12 feet is hot water (pre-)heating. But having watched the sun angles I realized that there were 5 feet above that which get winter but not summer sun. I made an air heater in that area. I suspect the air heating gets some heat rising from the water heater — I didn’t seal them off from one another. The hot water system is inspired by this design and will be the subject of another post. For the air heating, I did a variation on the “solar can heater” I used pre-made ducts rather than messing with a bunch of cans. I have a fan that draws air from the upstairs ceiling, thru the collector, and blows near the floor downstairs (opposite flow from the illustration). To control the hot air system, I installed two conventional thermostats. One is typical house heating thermostat (on when cold) and the other is an attic fan controller (on when hot). The combination (hot in the collector, cold in the house) turns the fan on. 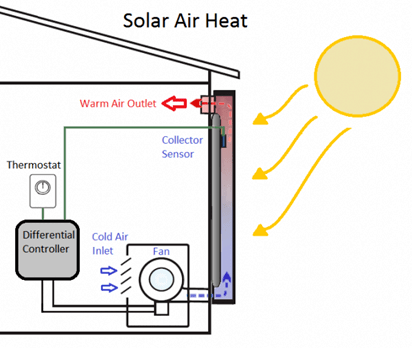 When the electric and heating was turned on I hooked up the solar air heater. In late October I measured 172F in the collector, 60F air going in upstairs and 122F air coming out downstairs. Last week I was able to do some more systematic data collection on two sunny days with similar outdoor conditions. Nov 21 was the experimental day, Nov 22 the control. What I found was that the heater can warm the downstairs by 10+ degrees F over the warming I get without the heater (just the sun in the windows and warming the south wall). I need to get some better instrumentation to take more data, but that will have to wait for another post. Footnote. 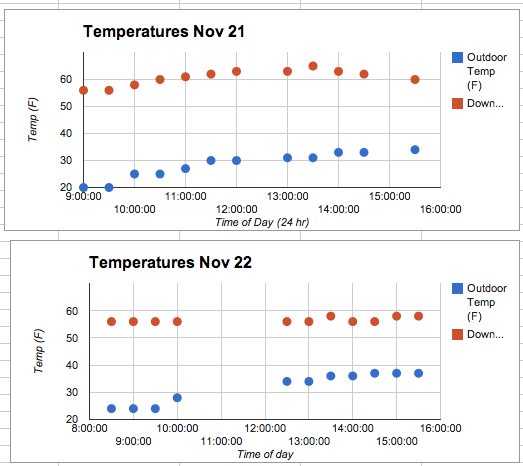 I have been mulling over how to get a better measure than these temperature data, what I want is units of energy. Since the only energy use in the building now is heating, I can read the meter for KWH in a 24 hour period. I just found this site where you can get heating degree days (1 degree-day = 1 degree difference in temperature for 24 hours). Even better, you can control the indoor reference temperature. SO, if I turn the solar off and pick a cloudy day, I have a measure of KWH/day and a measure of delta-T/day which will let me estimate the building overall R-value/day. I think I can use that estimate of R-value along with the KWH & degree-day for a sunny day to estimate the energy gathered by the solar system. I made 2 of these manifolds to fit 9 3″ duct. Duct material is 5 foot. 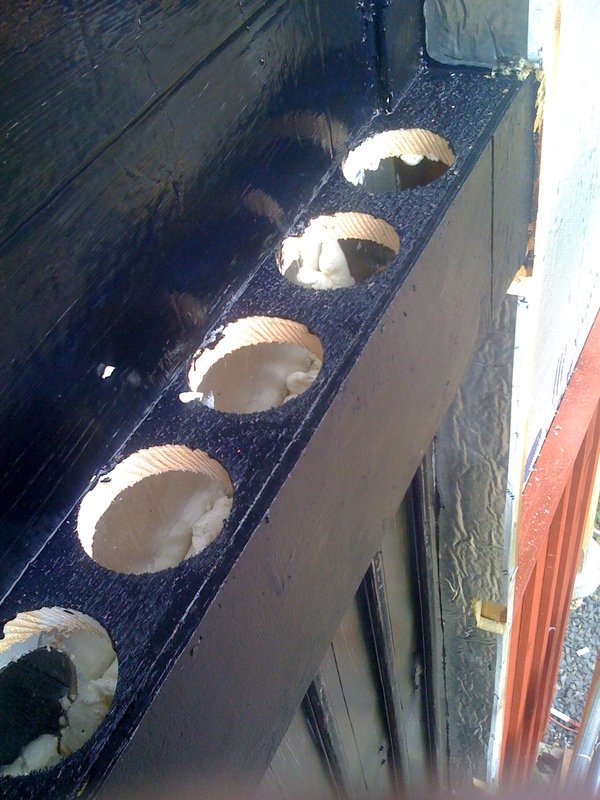 Backing is 1.5″ of TuffR rigid insulation painted black. 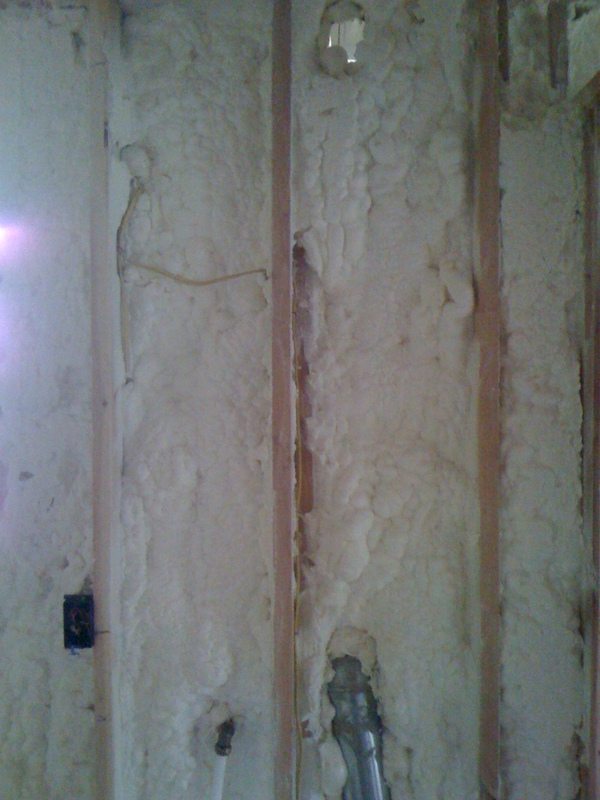 Once installed the pipes were sealed in with spray foam. Inside view upstairs. Hole at top is air going out to collector. Light comes in because collector not installed. 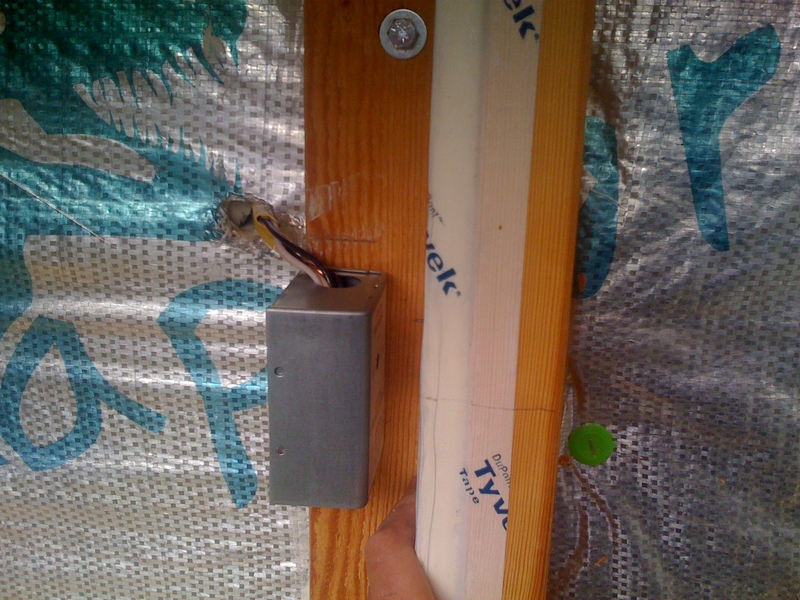 4″ duct below goes downstairs where fan draws air down. This is a conventional attic fan thermostat (on when hot) set at 90F. This (plus indoor temp) decide when fan comes on to draw air thru heater.